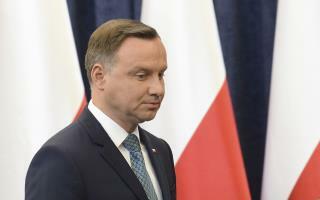 (Newser) – Poland's president has defied the leader of his country's powerful ruling party and blocked a plan to upend the court system. President Andrzej Duda vetoed two of three bills that would have given politicians far more control over the courts than they have now, reports Reuters. Critics said the changes, which would have allowed Poland's top judges to be effectively fired and replaced by the ruling Law and Justice Party, amounted to a political takeover of the judiciary. In fact, the European Union had warned that Poland might no longer qualify as a democracy had they gone through. A sane president seems to be the only bulwark against this radical, fascist christian govt. I hope they don't get the three fifths needed to reject this veto. It'll get real ugly if that happens.